Security Council votes to extend the mandate of the United Nations Mission in Liberia (UNMIL) through the end of 2016. The Security Council this morning extended the mandate of the United Nations Mission in Liberia (UNMIL) through the end of the year, while reaffirming its readiness to consider withdrawing the operation and transitioning to a future UN presence there following a proposed mid-November review of situation on the ground in the country. With the unanimous adoption of a new resolution, the Council extend UNMIL through 31 and decided that the authorized ceilings of the Mission’s military and police components should remain at 1240 and 606 personnel, respectively. Affirming its readiness to consider the withdrawal of UNMIL and transition to a future United Nations presence, the Council recalled its request that the Secretary-General conduct an assessment mission to Liberia to provide recommendations by 15 November, including an update on the proposed modalities regarding the transfer of the regional quick reaction force. Briefing the Council in late in August, Farid Zarif, Special Representative of the Secretary-General and Head of UNMIL, said many Liberians are concerned about the prospect of the Mission’s withdrawal and potential lack of UN support during the October 2017 presidential and legislative elections. 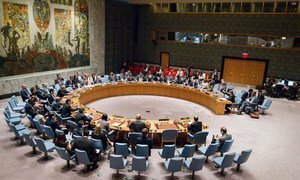 Although political space has opened in Libya and there is progress in the fight against terrorism, the political divisions underpinning the North African country’s conflict are deepening, a United Nations envoy warned today.